As a mother of two young daughters I remember feeling both afraid and empowered to be raising two beautiful women in this crazy modern world. It’s definitely no easy task especially with all the that’s been happening with women’s rights lately. But for me that meant I had the ability to help construct a whole new set of rules or guideposts for them to live by, and that is empowering in itself. 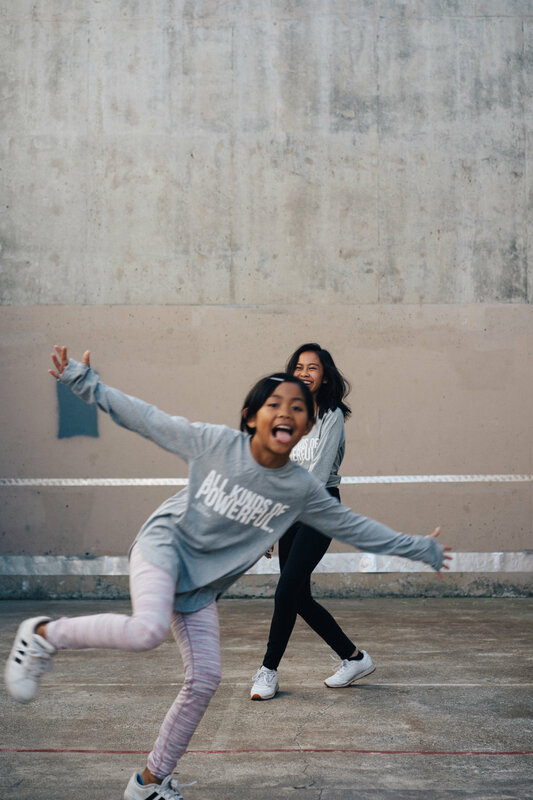 I’m so excited to be celebrating the International Day of the Girl with Athleta as they partner with Girls Leadership to help equip girls with skills to use the power of their voice. The International Day of the Girl is an important day for us to come together under the same goal to highlight, discuss, and take action to advance rights and opportunities for girls everywhere. And since women’s rights is still relatively new(ish) to us, it’s important that we celebrate it with our younger generation in any way we can. 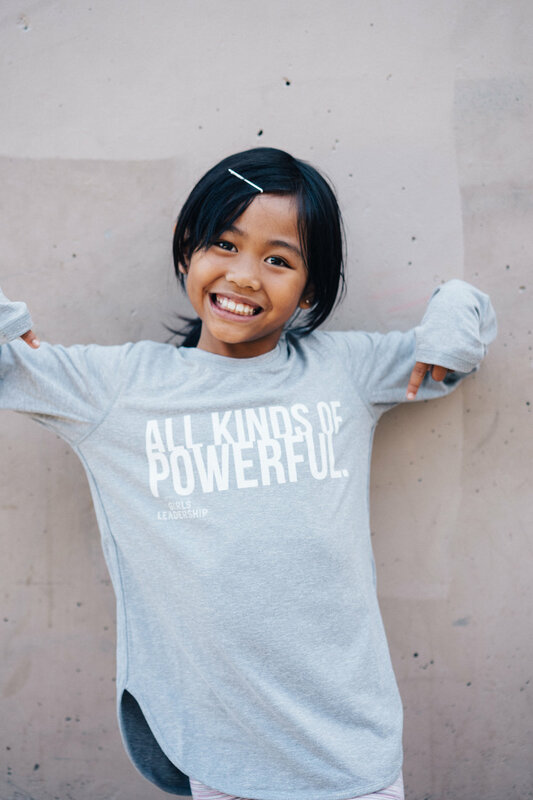 To help celebrate and support the work that Girls Leadership is doing, Athleta launched an exclusive line of limited edition All Kinds of Powerful mantra tees which the portion of the proceeds will be donated to Girls Leadership. Growing up my parents never spoke to me about bravery, courage, and the power of using my voice. I’m not sure if it was because I was a child of immigrant parents or if it was merely because they grew up in the time where it was the cultural norm for women to conform to all of society’s values instead of redefining their own. One of the things we’ve been doing a home a lot lately is defining our values on a deeper level. We’ve been asking ourselves how we want to live and lead our lives here at home for ourselves and for those around us. One of the things I challenge my girls with high-mileage questions so that they can investigate their thoughts around that answer and define something that is more authentic to them. I asked my girls what does power mean to them. Olivia had answered “Power to me is being strong and independent.” Hearing this answer made my heart sing because independence is one of those characteristics I value in people and to hear my 8 year old girl use that as a way to describe power tugged on my heart strings. My eldest Airis said, “To be powerful is to be strong and a good leader.” The moment she said a good leader, I thought WOW! These girls are so empowered and filled with integrity. They also understand that everyone’s definition of powerful is unique to that person and it doesn’t diminish another person’s perspective of it. In fact they choose to learn from the differences rather than distance themselves from the other person. Every girl deserves to know that she matters, she has a voice, and that voice can change the world around her. Here are some ways that you can strike up a conversation that helps her find ways to use her power. Acknowledge that she is already powerful. I cannot stress the importance of positive reinforcement and acknowledging the strength each person has inside, especially a young girl. Acknowledging one’s personal strength and power provides a strong foundation of self worth that they can continue to build on as they grow. Power is honesty when it comes from a place of love. Honesty and truth turns pain into power, but only when it comes from a pure place of love as the intention. When our voices are used in a malicious manner it doesn’t serve our highest purpose and only causes destruction. Help her find a version of power that works for her. There are so many different examples of female leaders who are strong, independent, and powerful in their voice. Some are introverts, others are extroverts, and there are plenty of women in different industries leading in different ways. Allowing them to see different examples gives them space to create an ideal version of what might work for themselves. Ask her to define power. Power is not about having control over a situation or person. It is however about having the influence to create positive change. Make sure to help her understand that her words matter and her actions can impact others. 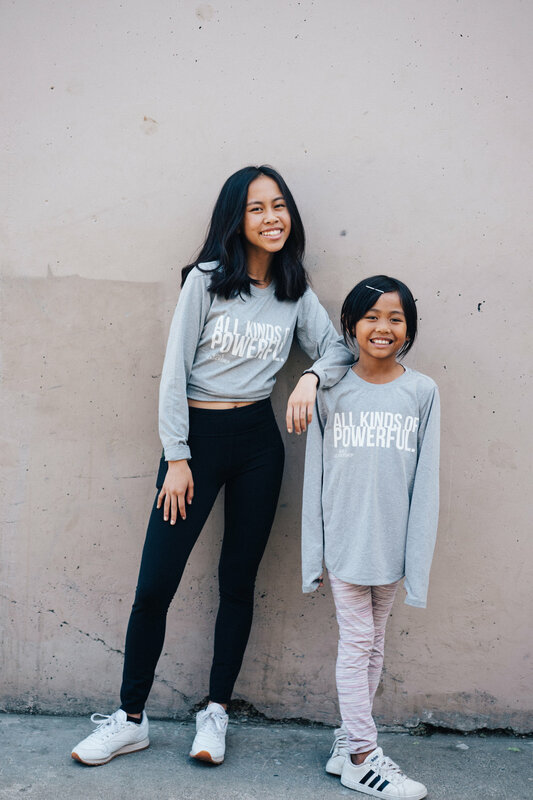 We’re celebrating this day by honoring our girls with love and celebrating them for their strength, courage, and power to be themselves. How are you celebrating? This post was sponsored by Athleta and I was compensated to write this post, but all the opinions are 100% my own. In the past 5 years, fitness and health have been cornerstones to my life. I’ve been using them as tools to help discover sides of me I had no idea were there. It’s helped me gain confidence, a much more positive self-image of myself, and a stronger sense of belief that I can be better, do better and create the wholesome life I want to live. As a mom, these are things I want to teach my daughters too, but my kids don’t see fitness or health the same way I do. Part of me wonders if it's due to this digital era we live in and the pressures we, as a society, place on looking good and performance in physical activity. Don’t get me wrong, I’m a bit of a data junkie myself and I love being able to measure and track my progress especially as it relates to self-improvement and personal development, but I’m a firm believer in having fun in order to stay in the game of health. I’ve had so many ups and downs in this journey of health and self-love. With all of the most recent road bumps in life, one of the greatest lessons I’ve learned is that you need to find something that brings you joy when it comes to exercise. Integrating joy in fitness is one thing you’ll need to have sustainable lifestyle change no matter what the challenge is you’re facing in life. 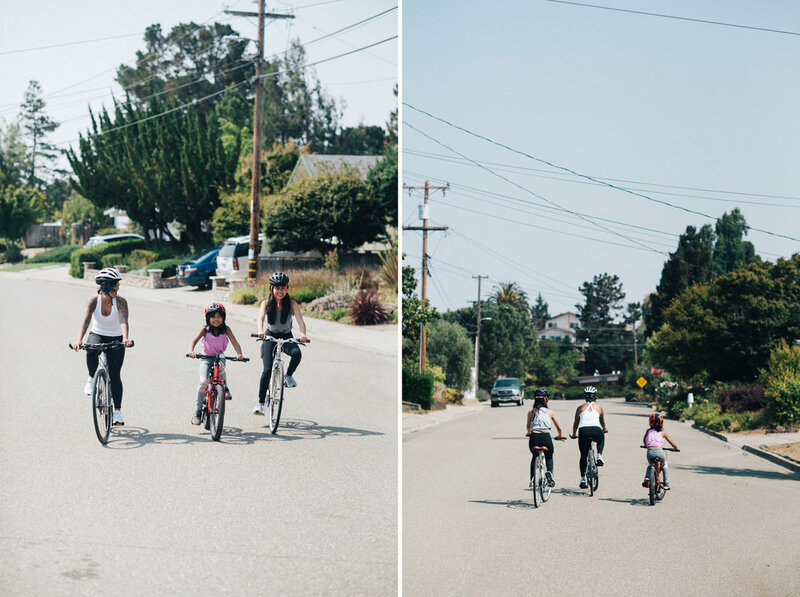 This is where biking comes in for us as a family. We love our bike rides. It’s the only physical activity my girls like to do outside of school sports and P.E. As a parent who believes that exercise is an important piece to a person’s mental and physical health I also believe that finding an activity that doesn’t feel like regimented exercise is just as important. Our neighborhood is filled with hill rides which turns what’s supposed to be a leisurely bike ride into what feels like the hills you climb during a 45-minute SoulCycle class. Our bike rides can get pretty brutal real fast, especially on a hot day which is why I love Athleta Girl. It’s athleisure for the girls who don’t give up, like mine. I love that its made with high-quality performance fabric that withstands multiple wash and drys and to top it off their styles are super cute. Olivia is wearing the Athleta Girl Spliced up Chit Chat Tight, one of those wardrobe pieces that’s lightweight enough for summer and perfect for school. She loves the pink detail on the knees which gives this particular tight the right amount of edginess she loves. 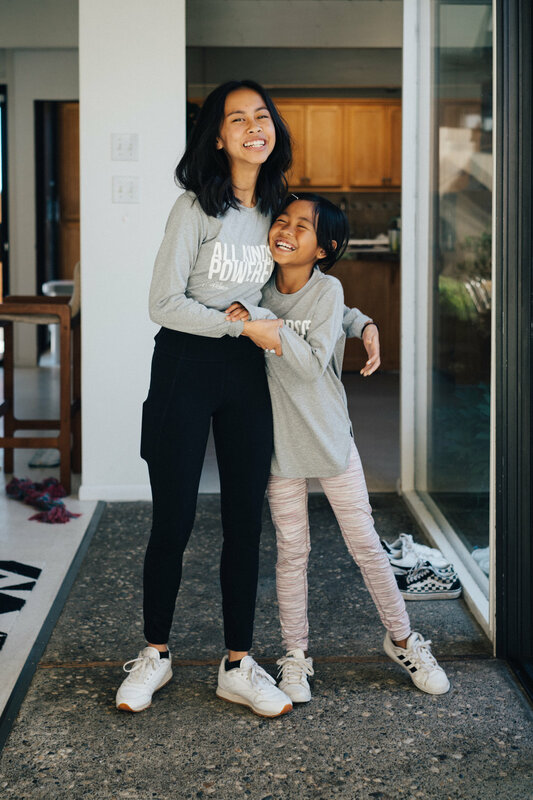 Both my girls are wearing the Power of Chi Tank, super awesome for the summer since its made of super light material and mesh, but since we’re in SF Bay Area it’s perfect to layer underneath sweaters or jackets. 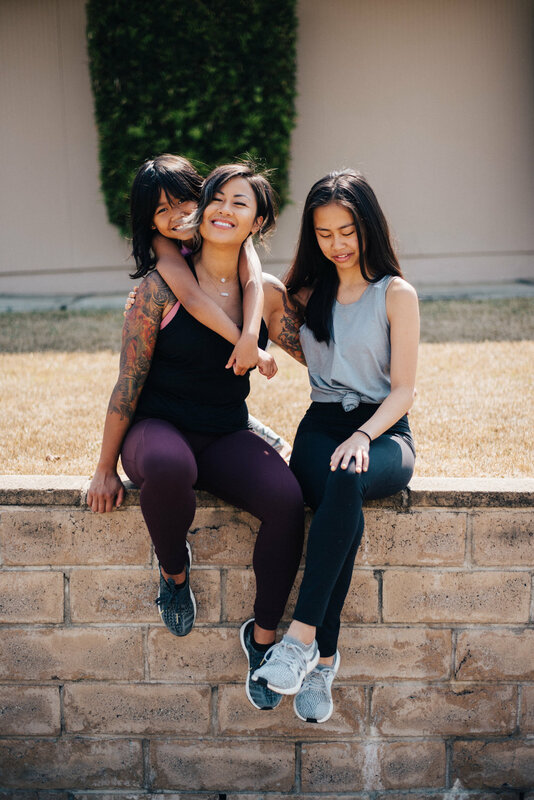 One of the things I love about Athleta Girl is that they have tights that fit my 14-year-old daughter that doesn’t feel like she’s wearing “kids” clothes, but is completely age appropriate for a teenager. She’s in this age where her she’s defining her personal style and fashion. The Stash Your Treasures tight is extremely soft, but with a slight compression making it great for days she SoulCycle’s with me or for days she’s running around with her friends. As the school year approaches for them again we’ve been talking a lot about fear, especially for my eldest who starts high school in just a few days. I remember high school and not quite understanding the value of sports or physical activity mainly because that wasn’t a high value in my household growing up. The fear of looking silly or stupid trying a new sport or exercise and I guess even now as adults we still hold some of that same fear within us. But if you can face the fear with fun, holding little to no expectations to the outcome then you can push past the limiting beliefs you place on what is or isn’t possible with your health goals and beyond. Along with joy, there are 4 other main things you need in order to stay in the game with your health goals when life gets a little bumpy. Gratitude improves our health, relationships, emotions, personality, and career. It strengthens our emotions and reduces the feeling of fear and envy. Gratitude also helps us bounce back from stress and keeps us in the present moment. Before any workout, I warm up with a 5-minute gratitude walk. If I’m weight training in the gym I typically do an incline walk on the treadmill. Before even thinking about my training, I thank my body for all that it does for me and it’s ability to move despite not always wanting to. Why are you on this health journey? What do you want to achieve at the end of it? When I started my fitness journey 5 years ago I told myself that I’m doing this because I wanted to be the healthiest version of myself in my 30s. This allowed me to define what healthy meant to me which gave me the power and freedom to create my own values around what it meant to be healthy. Making changes to your lifestyle can be really hard, but sustaining it doesn’t have to be. When I work with my clients we focus on choosing just one habit to change. Once this habit has become a routine in their life, we move on to another habit to change. While I’m not 100% free of self-doubt I can say that I believe in myself more strongly than I did before. I see my own potential with a lot more clarity than I have in the past. While there’s no true manual on how to improve believing in yourself, I do know that it takes practice. It also takes seeing failures as opportunities of growth. The power to stay in the game is not some mystical magic that only certain people have. You have it too. You just have to unlock a few doors and see what’s possible inside. When you do that you model the best behavior for those young girls who look up to and for those young girls who will be looking up to you.